Manchester City’s Bernardo Silva celebrates scoring their first goal in their 2-0 win over Fulham. 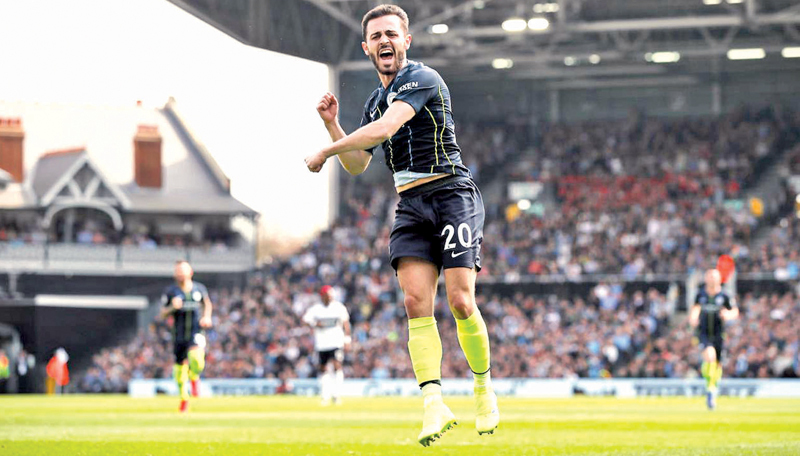 LONDON, Saturday: Manchester City swept back to the top of the table with a stylish 2-0 win at Fulham, while Huddersfield equalled the record for the earliest Premier League relegation after defeat at Crystal Palace on Saturday. 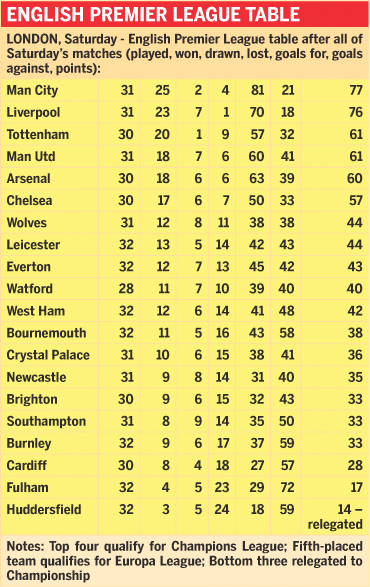 Bottom-of-the-table Huddersfield’s two-season stay in the top flight came to an end at Selhurst Park as they slumped to a 24th defeat in 32 league games by losing 2-0 at Palace. Huddersfield are only the second club to be relegated from the Premier League in March after Derby went down with 11 points in 2008. Sean Dyche’s side took the lead in the second minute when Chris Wood’s shot hit a post and deflected off Conor Coady for the Wolves’ defender’s third own goal this season. Dwight McNeil netted in the 77th minute to improve Burnley’s chances of survival.